Eden Hazard is set to feature in Chelsea’s Europa League clash with BATE Borisov on Thursday after travelling with the rest of the squad to Belarus. The Belgian star has been suffering with a back complaint since the 2-2 draw against Manchester United last month, but has been deemed fit enough to travel despite playing just 26 minutes against Crystal Palace on Sunday. 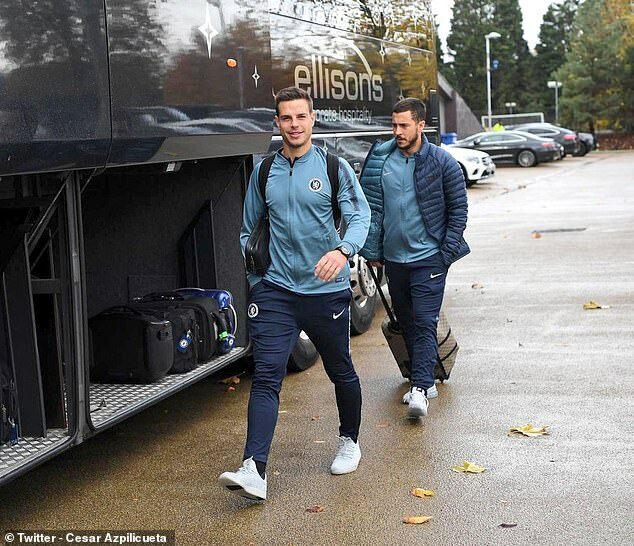 In a boost to manager Maurizio Sarri, Hazard was pictured boarding the team bus at Cobham on Wednesday morning ahead of their flight to Minsk. Sarri had previously urged caution with the Belgian in a bid to manage his injury, saying that he wasn’t fit enough to start the match against Palace over the weekend. After being given the all-clear, though, Hazard forms part of a strong travelling squad for the game at the Borisov Arena, with the likes of Jorginho and Willian also likely to be involved. 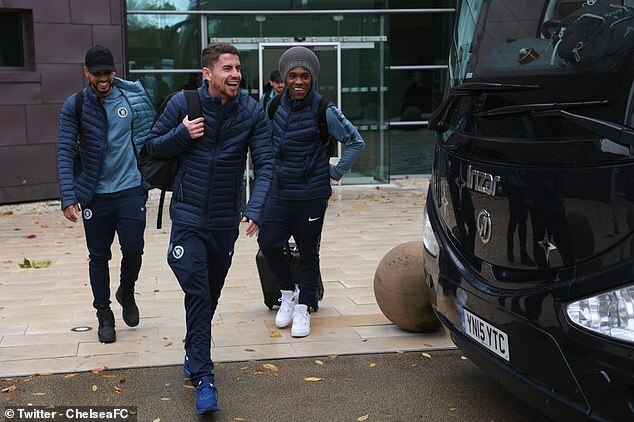 Chelsea’s stars departed for their Europa League clash sporting hats and winter coats as they prepare for the cold weather of Belarus. Seemingly fully aware of what awaits them in Eastern Europe, a host of first-team stars, including winger Pedro, braced themselves for freezing conditions as they left the club’s Cobham training ground on Wednesday. 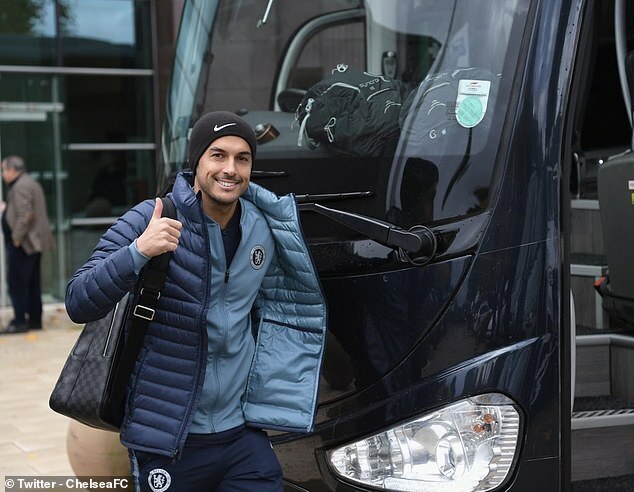 Forecasters predict that sub-zero temperatures await Maurizio Sarri’s men in Barysaw as they look to wrap up Group L.
Wearing a hat and coat, winger Pedro gave a thumbs up as he made his way onto the team bus. 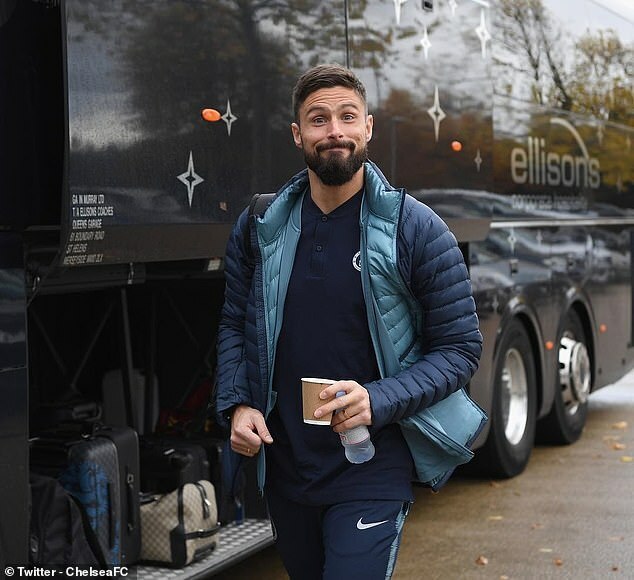 He was joined by in the travelling group by the likes of Olivier Giroud, Willian and Jorginho, with the latter two sharing a joke as they boarded the team bus. Willian and fellow countryman Emerson were later pictured on the team plane preparing for take-off ahead of the long flight to Belarus. Also in the group were teenage starlets Ethan Ampadu and Callum Hudson-Odoi, who could both be set to feature in the Group L tie. The Blues possess a 100 per cent record heading into the clash, and lead second-placed PAOK Salonika by six points with just three games to play. Chelsea have won their last four games in all competitions and will no doubt be looking to continue their excellent start to the campaign at BATE’s Borisov Arena. The two sides met at Stamford Bridge last month, with Ruben Loftus-Cheek bagging a hat-trick in a 3-1 Chelsea win.